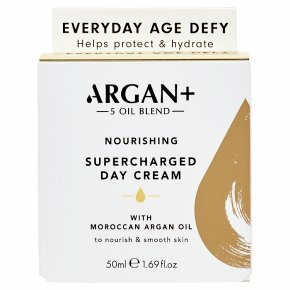 Hydrates, firms & re-energises skin.Super Charged Day Cream combines nourishing Peach Oil with the unique Argan+ Synergy to produce an intensely hydrating face cream. This enriched formula not only contains Vitamin E as a natural UV protector, but also helps prevents signs of ageing by restoring moisture and elasticity, giving skin a supple and re-energised glow. Argan+ Skincare blends precious Argan Oil with effective anti-ageing ingredients to deliver beautiful results. With regular use, skin is left feeling hydrated, revealing a freshener and younger looking complexion. Argan + Synergy is an all-natural 100% blend of precious Moroccan Argan Oil with 4 other amazing oils: Baobab, Kukui, Moringa and Sacha Inci, all selected for their restorative, regenerating and nourishing properties. Directions for Use: For best results, massage gently onto clean skin in the morning, before applying make-up.